If you are at this website, you likely have questions. Whether you have questions about your permit test, how to get your driver's license, or our DMV Test Cheat Sheets, we'll try to help with any confusion you may have. We've answered some common questions below that you can reference, which hopefully will provide the information that you're seeking. If you can't find the answer you're looking for, feel free to contact us via email or ask us on Facebook! How do I get my learner's permit? How do I get my driver's license? Are there any restrictions after becoming licensed? How can the Cheat Sheets help me? How old do I have to be to get a motorcycle permit? How do I get my motorcycle driver's license? Do I need the DMV Test Cheat Sheets? How do I get my commercial license? What does a commercial license allow me to drive? Can the DMV Test Cheat Sheets help me pass my test? Though different states have different laws, typically you must be 15 ½ years old in order to apply for a learner's permit (this isn't universal, however - in Alaska and Iowa, for example, you only need to be 14 years of age). In most states, you must also show that you have completed some amount of educational coursework or testing. For example, in Florida, individuals must pass a 4-hour drug and alcohol test before they can apply for their learner's permit. In California, teenagers must show proof of completion of a driver education and training course. Once your state's requirements are satisfied, you can apply for your learner's permit and take the required written test. Once you turn 16, you can apply for your permanent driver's license (in most states - South Dakota does not have a graduated licensing system and INDIVIDUALS can be licensed before they turn 16). 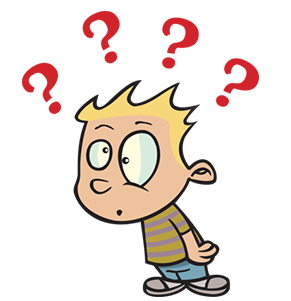 If you are less than 18 years of age, you need to obtain a learner's permit before you can get your driver's license. To do so, you will have to show proof of completion of a driver education and training course. Once you are eligible, you will need to complete a behind-the-wheel test (a written test may also be required if you are over 18 without a learner's permit or are from out of state, for example), during which you will be judged on your driving skills and ability to follow traffic laws, to obtain your driver's license. YES! Once you receive your driver's license, assuming you are less than 18 years of age, you will have restrictions placed on you. These restrictions typically apply to when you can drive and who you can drive with. Though each state is different, there is usually a curfew for minor drivers. Between these hours, you are not allowed to drive. Additionally, you will likely be restricted on who you can have in the car with you when you are driving. This restriction typically lasts for six months to one year. It's simple - our DMV Test Cheat Sheets can help you pass your written test on your FIRST TRY. If you are applying for your learner's permit or driver's license, our Automobile DMV Test Cheat Sheet is the resource you've been looking for. 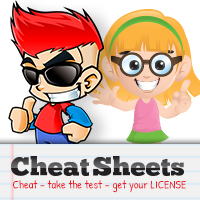 We have test cheat sheets for every state and every license type. Access it on your phone and the answers you're looking for will never be more than a glance away. Why Should You Get a Cheat Sheet? As with automobile learner's permits, most states allow you to apply for a motorcycle permit once you've reached 15 ½ years of age. Again, the required age will vary from state to state - checking with your local motor vehicle department can provide you with more specific information. Once you have reached the required age, you will be required to take a written exam before you are able to obtain your permit. In many states, you will also have to take some form of driver education and training course, with other possible restrictions including vision exams and drug and alcohol courses. If you are under 16, you will first have to obtain your learner's permit (nearly all states have graduated licensing programs). If you are under 18 years of age, but older than 16, you will have to prove that you have completed your state's rider training and education course, or have completed a similar parent-taught training course (if your state permits it). Once this is satisfied, you will take a riding test (and a written exam of motorcycle-specific traffic laws if you do not have a permit or are from out of state). If you are under 18, then the answer is YES. As with automobile licenses, riders may be subject to curfews, and if the license is considered a restricted license, certain riding restrictions may also apply, such as riding with passengers or on the freeway. Checking with your state's motor vehicle department is a good way of finding out which restrictions may apply to you. Do you want to pass your written test on your FIRST TRY? Then yes, you should use our Motorcycle DMV Test Cheat Sheets! These state- and license-specific test cheat sheets have all of the information that you need to pass, and nothing more, right at your fingertips. All you need is a smartphone or network-enabled tablet. With our DMV Test Cheat Sheets, you can pass your motorcycle permit written test with ease. In the United States, you must be at least 18 years of age to get your commercial driver's license (CDL). If you receive your license and you are less than 21 years old, you will be restricted to driving within your own state. To drive commercial vehicles across state lines, you must be at least 21 years old. You will first have to get a commercial permit, which requires passing a written test on the various traffic laws and regulations that apply to commercial vehicles. Once you have received your permit, you will be able to apply for a permanent commercial driver's license. To get your license, you will have to complete a pre-trip inspection of your vehicle and a driving test in the vehicle type that you want to be licensed in. These tests are designed to demonstrate that you have a complete knowledge of vehicle maintenance and operation. It depends on the type of commercial license that you receive. There are three different classes of commercial license: Class A, B, and C.
The Class A license lets you drive combination vehicles (tractor-trailers or straight truck and trailer combos) of 26,000 lbs. or more. With a Class B license, you can drive single vehicles of 26,000 lbs. or more, as well as combination vehicles less than 26,000 lbs. in gross vehicle weight (GVW). Finally, a Class C commercial license lets you drive any type of commercial vehicle not covered by Class A or B. This may include heavy-duty, non-commercial trucks with trailers capable of carrying more than 16,000 lbs., or single vehicles greater than 16,000 lbs. but less than 26,000 lbs. The type of license that you receive is extremely important, as it will determine what types of vehicles you are allowed to drive. If you plan on a career as an interstate trucker, then you will need a Class A license. If you simply want to make some money while you go to college, then a Class C or Class B commercial license may be all that you need. YES! After you receive your commercial license, you will be restricted based on what license type you have (Class A, B, or C) as well as what type of vehicle you are driving. To drive certain types of vehicles - such as those transporting hazardous materials or passengers, or trucks that utilize air brakes - you will need to get specific endorsements. To obtain an endorsement, you will need to take a written test for each with your local motor vehicle department. Once you have obtained these endorsements, you are able to drive a much greater variety of vehicles, which can help you move up in your career as a commercial driver. The answer is YES! We have Commercial DMV Test Cheat Sheets for every state, CDL class, and commercial vehicle endorsement. Have all of the information that you need to pass your test and nothing more, right at your fingertips. Earn your CDL or endorsement, stress-free! Our DMV Test Cheat Sheets have the information that you need to breeze through your written tests.